Image of the Profiled corrugated conical horn. 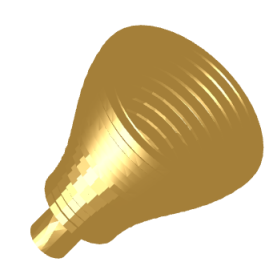 The profiled corrugated conical horn antenna may be designed for a number of profiles, including sinusoidal, tangential, exponential, hyperbolic and polynomial. Variables controlling the shape of the profiles include a profile power index (p) and a profile addition index (A), which are chosen (where applicable) as Sinusoidal (p=2, A=0.8), Tangential (p=2, A=0.9) and Polynomial (p=2). The various corrugated profiles – all with an equal number of slots and flare diameter – are shown in the Figure above. Although the introduction of a profile may result in a shorter structure, it does come at the expense of raised side lobe levels and low cross-polarisation, mainly due to the HE12 mode excited by the varying flare angle along the profile. The various profiles perform quite differently – some better than the standard linear profile, and some worse. Typically, the sinusoidal and polynomial profiles provide the best compact alternative to the linear profile. Comparing structures designed for equal gain, it is clear how a correct profile results in a more compact structure, albeit at the expense of increased side lobes. Also, in cases where the profiled structure is comparatively sized to the linear one (see hyperbolic vs linear) the overall performance of the profiled version seems slightly better, with lower shoulders than the linear version.